We’d love your help. Let us know what’s wrong with this preview of New Horizons by Joanne Van Leerdam. This book of short stories made me smile and wonder and think. Just the thing short stories should do. I enjoyed the quirkiness of some of the characters. Some stories are so short and cute that I just had to smile. The princess with a tissue was one such story. I think that Joanne Van Leerdam has a poetic way of writing that comes naturally to her. She says a lot in a short amount of space. For a small book, this made a big impression on me. Not all had the ending I expected, which made it even This book of short stories made me smile and wonder and think. Just the thing short stories should do. I enjoyed the quirkiness of some of the characters. Some stories are so short and cute that I just had to smile. The princess with a tissue was one such story. I think that Joanne Van Leerdam has a poetic way of writing that comes naturally to her. New Horizons features 16 short short stories, flash fiction and prose poetry works connected by the theme of how people react to a moment of change. Sometimes these are subtle, like a teacher showing kindness to a girl with a rotten cold, sometimes they’re more significant. A few have a dark edge. My favourite, Dead Lucky, was the one that concerned the ultimate change in life, told as a mundane but engrossing story about some missing paperwork. I read that one twice. Close second was Karma Trai New Horizons features 16 short short stories, flash fiction and prose poetry works connected by the theme of how people react to a moment of change. Sometimes these are subtle, like a teacher showing kindness to a girl with a rotten cold, sometimes they’re more significant. A few have a dark edge. My favourite, Dead Lucky, was the one that concerned the ultimate change in life, told as a mundane but engrossing story about some missing paperwork. I read that one twice. Close second was Karma Train, which is a very clever tale with a twist. It’s clear Joanne Van Leerdam is sometimes more concerned with the way the words go together than the plot. She is a poet after all. Many of the stories are brief impressions, less than a page, but together the 16 stories have a rhythm of their own, long, short, short and so forth, rather like someone transmitting Morse Code. I wondered if Joanne Van Leerdam had planted an Easter Egg in the text and was tempted to enter the dashes and dots into a Morse code translator to see what it spelled, but that would probably have me classified alongside people who believe there are aliens living amongst us. Joanne Van Leerdam has taken a break from writing poetry to put together her first collection of short stories. For many of us, there comes a time in our lives when we finally put our foot down. Or draw the line. Or turn over a new leaf. Or pack our suitcase. Like the news anchor who’s about to be given the boot in the 70s film “Network,” we “are mad as hell and… not going to take it anymore.” Many of the short stories in this collection capture the moment when we declare our emotional freedom. In other stories, the page is turned not by the characters, but by fate, perhaps, or maybe dumb luck, or just hu For many of us, there comes a time in our lives when we finally put our foot down. Or draw the line. Or turn over a new leaf. Or pack our suitcase. Like the news anchor who’s about to be given the boot in the 70s film “Network,” we “are mad as hell and… not going to take it anymore.” Many of the short stories in this collection capture the moment when we declare our emotional freedom. In other stories, the page is turned not by the characters, but by fate, perhaps, or maybe dumb luck, or just human frailty. We get an inside look into the emotions of average people just like us as they face changes dropped into their laps. Some good, some bad. A stroke. A kidnapping. An opening for a pole dancer at a nightclub. Among my favorites: “A Most Educational Quiz,” because it’s just so clever. It’s hard to say much without including a spoiler, but I will say it involves calling into a radio game show and learning a lot more than the young man bargained for. “Dead Lucky” is clever too – about a worker in a doctor’s office losing an important document. And “Late Fall” is the sad story of a middle-aged woman realizing her marriage doesn’t have much love in it anymore. A fine short story collection. 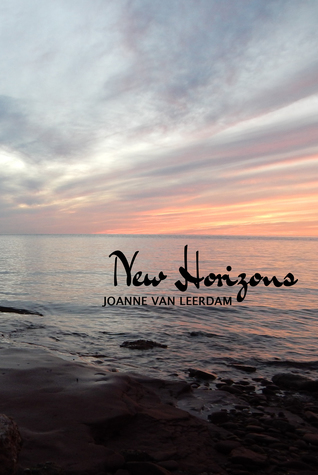 In “New Horizons”, Poet Joanne Van Leerdam plies her talent at short story writing and succeeds brilliantly. Each tale contained in this short collection is a gem in and of itself, showing the diversity of the human condition and how the heart reacts to various life situations. From the birth of a child, to the loneliness of old age, to the heartache of lost love, this insightful and touching collection of short stories will elicit strong emotions of resolution and reconciliation in almost every In “New Horizons”, Poet Joanne Van Leerdam plies her talent at short story writing and succeeds brilliantly. Each tale contained in this short collection is a gem in and of itself, showing the diversity of the human condition and how the heart reacts to various life situations. From the birth of a child, to the loneliness of old age, to the heartache of lost love, this insightful and touching collection of short stories will elicit strong emotions of resolution and reconciliation in almost everyone. I highly recommend Van Leerdam’s work for anyone seeking inspiration, motivation, and understanding. Like “little prayers”, these short stories may provide a response to life’s questions that might have otherwise gone unanswered. Naturally a poet, Joanne Van Leerdam released this collection of short stories and has proven her imagination knows no bounds. This collection revolves around the same subject—the experience when people find themselves in situations they didn't see coming and how they deal with them. Hidden treasures found in each story! Speculative Fiction at its Finest! It’s been years since I read a single short story, let alone a collection of them, preferring to hunker down with a novel for its extended and gradual development of characters and plot with a discernible beginning, middle, and end. Hence, I was sorely disappointed after I’d finished nibbling the first literary appetizer in the collection, aptly titled, “New Horizons,” because I hungered for affirmation that Meghan and Andrew would embark on a romantic relationship. But, most life events do not unfold sequentially or satisfactorily. Nor are we always privy to an individual’s “inside story” or any foreseeable resolution to a problem. Therefore, the author offers more than enough in each story punctuated by synchronicity of chance, randomness, sardonic wit, or irony. Don’t hesitate or speculate in acquiring a copy of ‘New Horizons,’ speculative fiction at its finest! I’ve not really explored many short story books; I find I avoid them lest their contents are too… well, short. Often times I tend to feel that I’m not given an opportunity to really immerse myself in a story, it starts and as soon as it does, it’s over and I am left feeling rather put out and not entirely satisfied. New Horizons, as explained by author Joanne Van Leerdam is a collection of "16 short stories offering insights into how people respond when they encounter experiences and events they I’ve not really explored many short story books; I find I avoid them lest their contents are too… well, short. Often times I tend to feel that I’m not given an opportunity to really immerse myself in a story, it starts and as soon as it does, it’s over and I am left feeling rather put out and not entirely satisfied. New Horizons, as explained by author Joanne Van Leerdam is a collection of "16 short stories offering insights into how people respond when they encounter experiences and events they have not foreseen, or when they discover new horizons in their lives." With each story it’s as though Joanne lifted the ceiling off of an apartment complex and has recorded the lives of each unit’s inhabitants. Though short, there is no lack of beautifully structured sentences which leaves you knowing exactly how each character is feeling, despite no solid climax, the imagination needs little convincing about the next steps or thoughts of the characters as we move onto the next story. One story is not even a full page length long, while another reaches 5 pages, but with each you are taken on a vividly brief but powerfully emotional trip. It really is an examination of the very basic nature of people, it’s poetically written and there’s just something which is so absolutely accurate and relatable about each story that struck me like an axe. I have a new found respect for short stories after reading New Horizons. Revelation left me feeling as though my own thoughts, many moons ago, had been taken from the recesses of my mind and put to paper. Lucy had me giggling at her completely paradoxical approach to life outside of school, whereas Late Fall had me contemplating on how important marriage-maintenance can be. And still others showing that life can change at the flip of a switch, or the moment an item is not left where it’s always been. I would absolutely love to see Joanne venture into a slightly longer story in the future, I feel she’d do really, really well at it and that I'd just simply have to get my hands on it. A lovely assortment of short stories. Each center around a pivotal and decisive moment where the characters are embarking in some way on a new path in their life. I enjoyed the honesty in which the characters face their situations. I found myself contemplating, rereading and enjoying all! I look forward to reading more from author. This is a wonderful assortment of short stories. Many centered around having the courage to pursue new horizons. How does a leaf know when to fall? It just does. The wind will guide our fall. A series of short stories ranging from one page to several pages. I enjoyed the writer's style and ability to capture emotions in such short pieces. A stellar collection of short stories, each one with a different take on the theme. As well as shorts, there's some flash fiction/micro fiction in the collection which I loved. The stories don't necessarily end all neatly wrapped up and that's something else that I enjoyed. As for my favourite, it was "Rube". There was a lot to think about under the surface (a trait with most of the stories, I found). Is he just a "bad seed" or is there something more to things? The way he re-writes his personal A stellar collection of short stories, each one with a different take on the theme. As well as shorts, there's some flash fiction/micro fiction in the collection which I loved. The stories don't necessarily end all neatly wrapped up and that's something else that I enjoyed. As for my favourite, it was "Rube". There was a lot to think about under the surface (a trait with most of the stories, I found). Is he just a "bad seed" or is there something more to things? The way he re-writes his personal history was equally fascinating. "Lucy" was also a favourite. I don't usually read this type of book, but I am glad I bought it! Some sweet, some sad, even the shortest story had meaning. Quick, entertaining plots will delight readers everywhere. And this evening comes with a load of distraction reading! Because I fail as a human being and I'll just continue to read until I feel better. Anyway I've been after this particular for a while, and it's by another indie Joanne Van Leerdam (who is awesome) and well I read this in one sitting and enjoyed it. At least it was a quick read anyway and I'm all for short stories (even though I fail to write them and I might be pushing one back.) There's a slight chance I may be picking up Joanne's othe And this evening comes with a load of distraction reading! Because I fail as a human being and I'll just continue to read until I feel better. Anyway I've been after this particular for a while, and it's by another indie Joanne Van Leerdam (who is awesome) and well I read this in one sitting and enjoyed it. At least it was a quick read anyway and I'm all for short stories (even though I fail to write them and I might be pushing one back.) There's a slight chance I may be picking up Joanne's other books in the near future.